Earth’s moon and Mars have been the focus of most of the speculation about alien monuments and other traces of their activity. This is partly because they are very close neighbours and partly because they are much less hostile than worlds such as Venus (with its sulphuric acid rain and a surface temperature that would melt lead) or Jupiter (a giant ball of volatile gases, so massive that its core is composed of metallic hydrogen). Mars, especially, was clearly once more earth-like than it now is. However, these problems with more distant worlds have not prevented some authors from detecting all manner of artificial structures on them. Perhaps the first to be treated in this way were Phobos and Deimos, the tiny moons of Mars, whose unusually close (and therefore rapid) orbits around the planet coupled with their small size, led to speculations by none other than Carl Sagan, among others, that they might be artificial. Alas, when the first close-up photographs were obtained, they turned out to be cratered rocks resembling deformed potatoes. We now know, thanks to fly-bys of asteroids, that they are typical of the minor bodies of the solar system, particularly those whose orbits lie between those of Mars and Jupiter. Mimas: blown like a bubble or a natural rocky moon? Perhaps the most bizarre of the claims concerns the various planetary satellites or moons, especially of the outer planets. 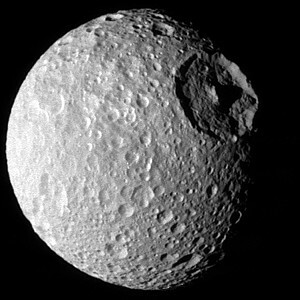 Several of them (the Saturnian satellites Mimas, Rhea and Tethys are the most obvious) have one exceptionally large crater with a central peak. Our own moon has a similar feature, the Mare Orientale on the very eastern edge of the side that faces earth. David Childress has suggested that these features are similar to the umbilical scars resulting from the blowing of glass spheres. The implication is that these satellites are hollow and artificial, echoing the claims once made for the Martian moons Phobos and Deimos. These are not hypotheses that archaeologists are equipped to evaluate. The opinions of astro-geologists (who are qualified to assess these things) are that planetary satellites are of much the same age as the planets they orbit and that they display all the characteristics of the same sorts of formation processes as the planets. Large craters of this type are most economically explained as the result of ancient asteroid or meteor impacts. Childress is funny. Implying Mimas may have been blown up and hollow is absurd. 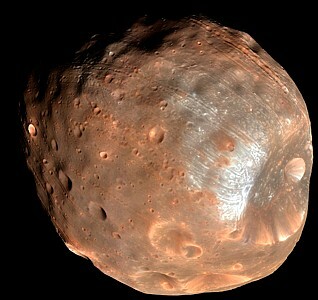 Why does Phobos look red on the photo? I just wonder about it.